Born in New York City, Joseph Borg, spent seven formative years on the Isle of Malta. Working as an apprentice for a local fine artist, Maestro Carmelo Spiteri, his artistic seeds were sown. Having no formal fine arts education, Joe developed his artistic abilities through apprenticeships with various fine artists and master printers. 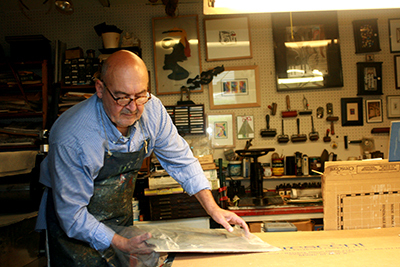 An artist and master printer, specializes in the traditional intaglio method, utilizing the monoprint technique as a means of endless experimentation. Mr. Borg’s work has been exhibited and well received in the U.S. and abroad. His work has been chosen to be the first and only visual art found in the living quarters of Biosphere II, a life sustaining experimental habitat in Oracle, Arizona. The Art in Embassies Program (AIEP), one of the US Department of State program’s, was pleased to select Joseph’s work for Embassies and official residences abroad. * The World Bank, in Washington D.C., acquired a number of his works to be included in their collection. Joe Borg exhibits throughout the United States, Europe, and Asia. His works are part of many public and private collections. Miniature Painters, Sculptors & Gravers Society of Washington, D.C.
Crescent Gallery, Huntington, NEW YORK. International Association of Visual Artists, Washington, D.C.
Somersett Gallery, Huntington, NEW YORK. World Bank Art Program, Washington D.C.